There are a number of ways to program AVR microcontroller chips. For my DIY projects, I like to save money by buying components and putting them together to create what I need. I bought some blank ATMEGA 328P micro controllers so that I could make Arduino circuit boards for my projects. Building the Arduino circuit board myself rather than buying the completed Arduino saves money. Granted, it takes more time, but to me it is more satisfying to do it myself. Since I have blank chips, they need the Arduino Bootloader programmed in. My favorite programmer for that purpose is a Raspberry Pi shown below. 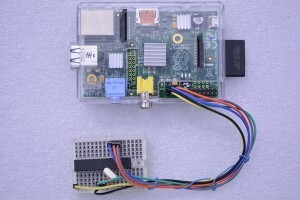 It uses a modified version of AVRDude especially for the Raspberry Pi. Instructions on how to get it and use it are here. The astute observer will note that besides the 6 wires, I have a 16Mgz crystal on the breadboard. If the chip is blank when it is being programmed this crystal is not needed, however there are times when I reprogram a chip. For those times, the crystal is needed because the fuses are set to use external clocking rather than the internal clock. (Big brother to an MCU).